IAM airline crew members from across the United States are showing their support for striking British Airways Mixed Fleet crew. Watch our Stand in Solidarity video. 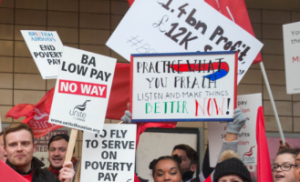 The Mixed Fleet crew, which operates some long and short haul flights, has been subjected to lower pay and substandard employment conditions compared to other British Airways employees since the carrier created the group after a 2011 strike. Read Pantoja’s full support letter here. Stay up-to-date with the strike at UniteTheUnion.org.